Cream butter or margarine, brown sugar, sugar, eggs and vanilla until light and fluffy. Combine flour, baking soda and salt; add to creamed mixture. 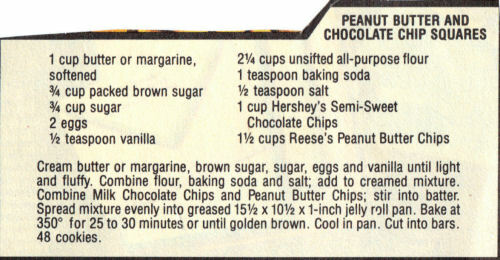 Combine Milk Chocolate Chips and Peanut Butter Chips; stir into batter. Spread mixture evenly into greased 15 1/2 x 10 1/2 x 1-inch jelly roll pan. Bake at 350° for 25 to 30 minutes or until golden brown. Cool in pan. Cut into bars. 48 cookies.